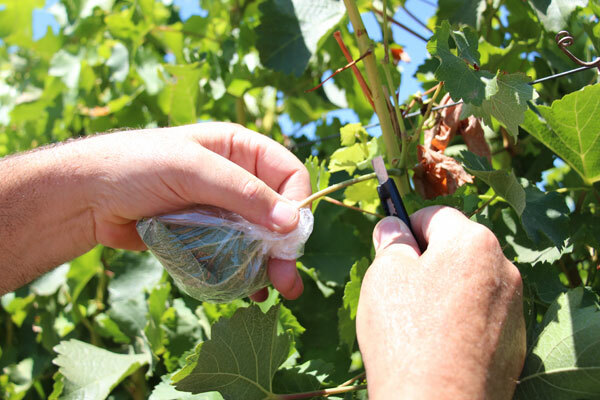 There are two different methods of measuring water stress in wine grapes. 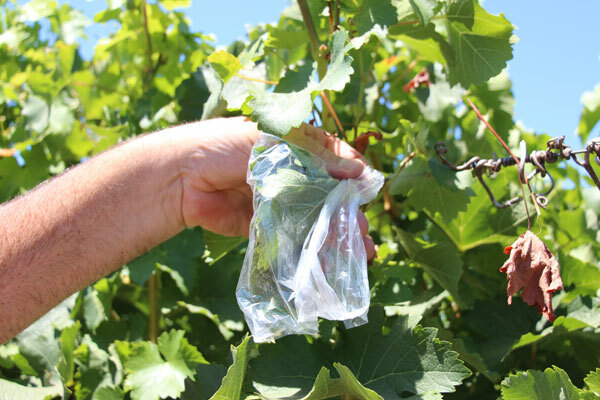 The most popular method used in commercial vineyards is the Leaf Water Potential (LWP) method. 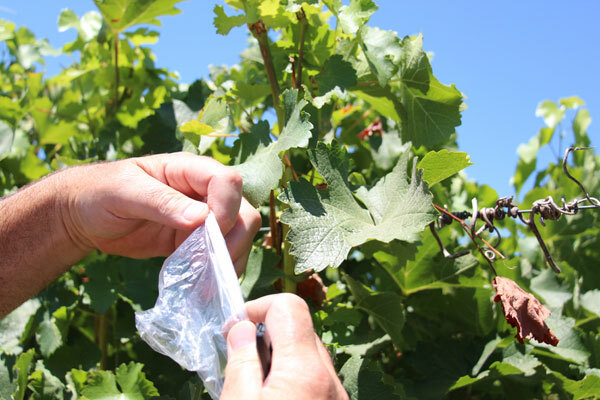 The other method is called Stem Water Potential (SWP) and involves putting a foil laminate bag on the leaf for at least 10 minutes to allow the leaf to equilibrate with the vine. This tutorial demonstrates the LWP method. 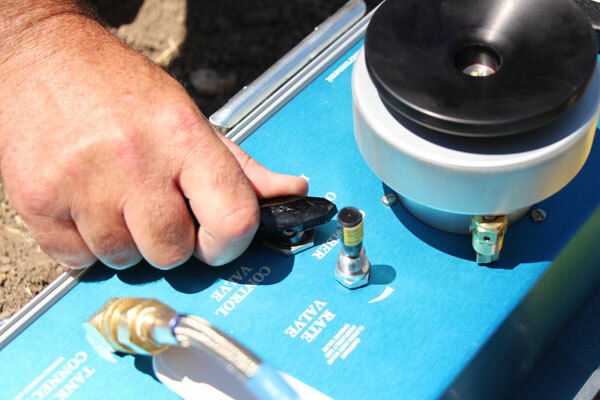 First, ensure readings are taken consistently within about 2 hours of solar noon. This will change as these season progresses, but normally is about 11:30 AM to 2:30 PM on the Pacific Coast in the USA. 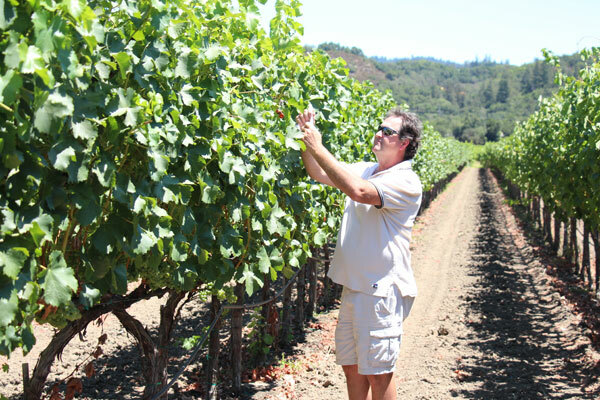 Select a vine for sampling. 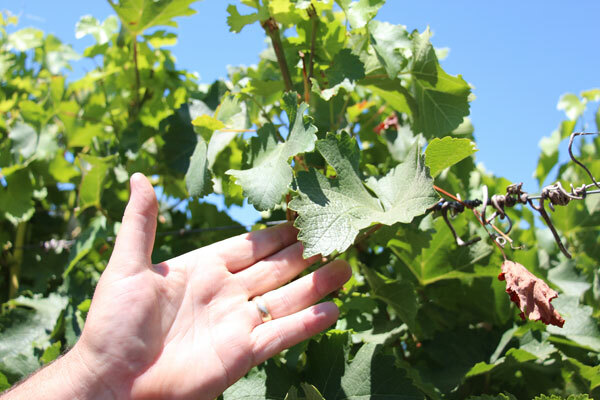 The vine to be sampled should be a good representative of the vineyard irrigation block. Try not to sample at the end of a row, but move in at least 5 plants from the end of the row. Select a leaf that is fully exposed to the sun. The leaf should be at least the 5th from the end of the tendril. Leaf should be a healthy, fully expanded leaf with no insect holes, good color and no mildew. Place a sandwich bag (pleated top not zip-loc) over the leaf. 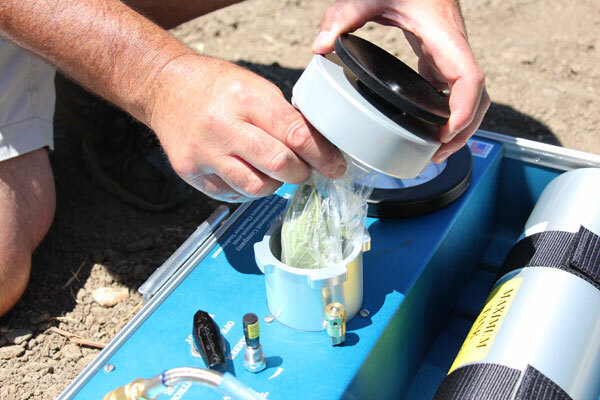 This bag simply creates a micro-environment that slows transpiration during testing. Roll the bag mouth closed around the petiole and cut with a razor blade or knife. Insert the petiole into the hole in the bottom side of the lid. Twist the Compression Gland clock-wise to seal the gasket around the petiole. The petiole should just be barely protruding from the lid. Insert the leaf and bag together down into the chamber. 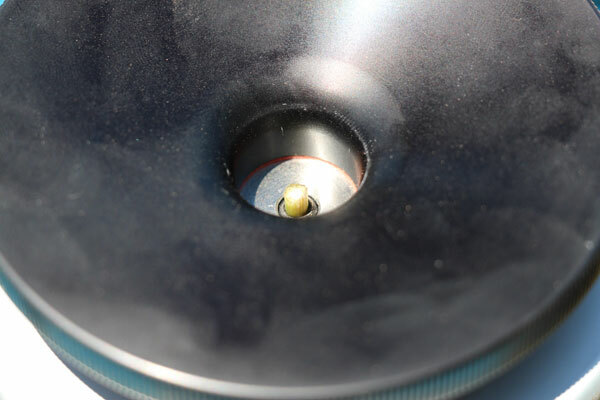 Push down and turn clockwise to lock the chamber lid in place. 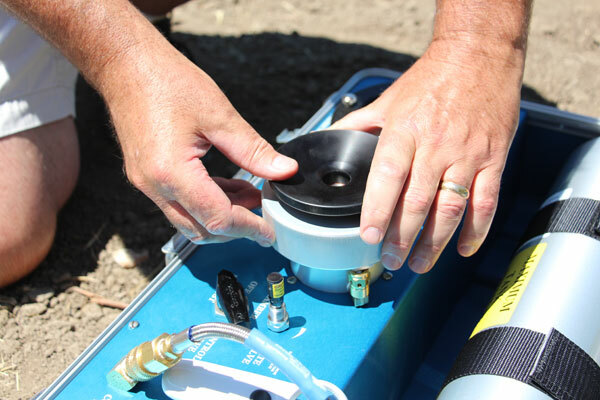 The instrument Rate Valve flow should be pre-set at about 1 Bar/ 2 seconds or slower. 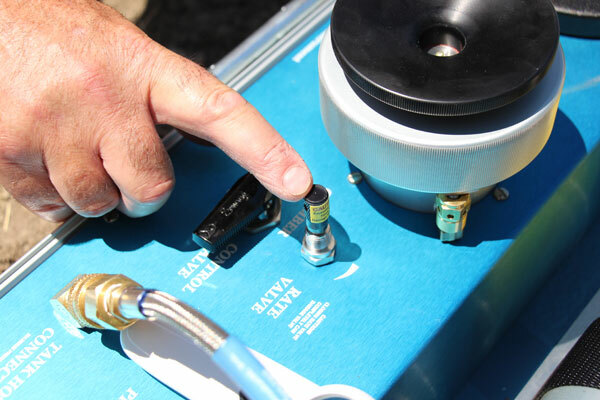 Turn the Control Valve to “CHAMBER” and begin to pressurize the chamber. The end of the petiole should look dry at first. As the pressure in the chamber increases, there may be some bubbling of water in the phloem vessels. This should be ignored and can be wiped away with your finger if it is distracting. The actual “end-point” or Leaf Water Potential is read when water comes to the surface of the end of the petiole. This water will come from the center of the petiole. In grapes there will actually be a slight color change in the surface as the water appears. Immediately turn the Control Valve to the OFF position. 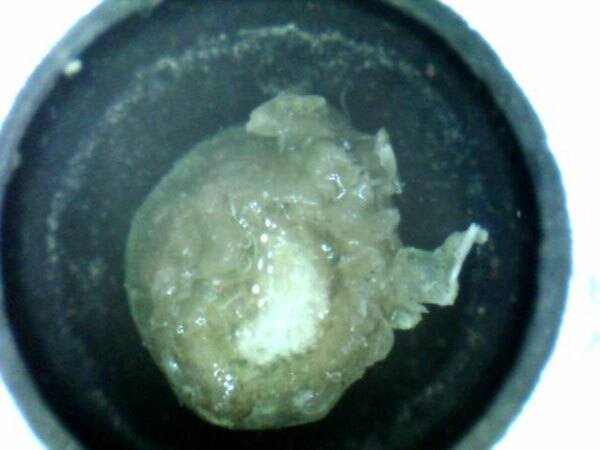 As the pressure continues on the leaf, water will begin to bubble up from the center of the petiole out of the xylem vessels. 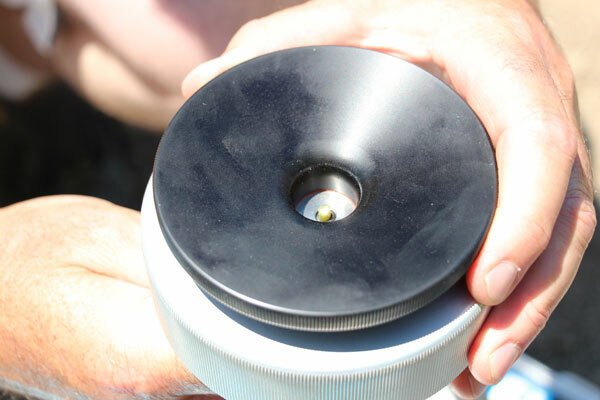 Record the amount of pressure that was required to push the water to the cut surface. This is the Leaf Water Potential (LWP). 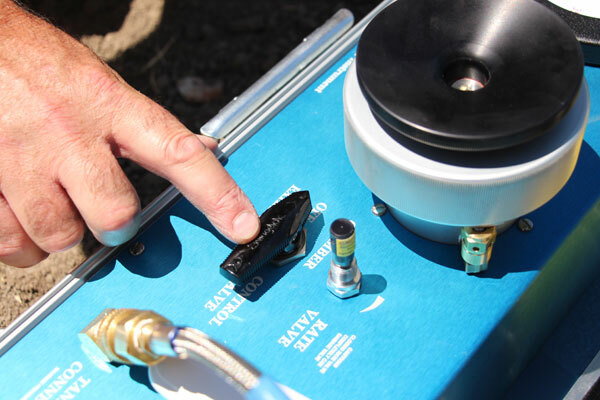 Three readings per irrigation block are recommended. Extending readings past the two hour window of solar noon will create readings that are not comparable from day to day. 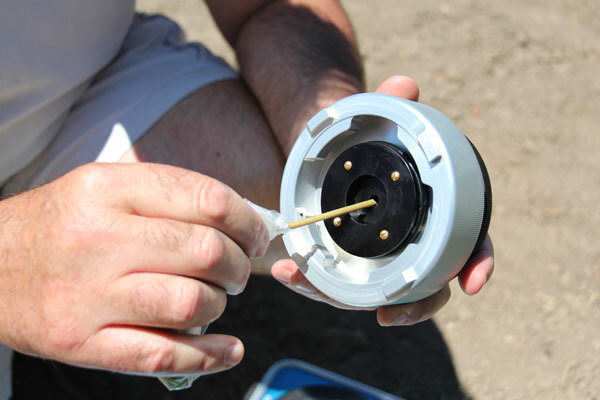 Recording air temp, humidity, wind speed and any other relevant weather changes will help correlate changes in readings from day to day and make irrigation scheduling decisions easier. Ensure you pay close attention to the end-point. Not stopping the pressure right when the water appears will create an error in the reading. Testing without a plastic sandwich bag can create differences as great as 2 bar in the readings. 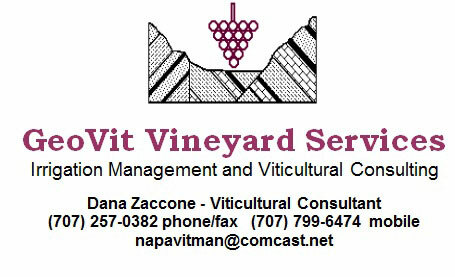 We want to thank Dana Zaccone at Geovit Vineyard Services in Napa, California for helping us to shoot this tutorial. THANKS!